Over the past few days whilst diving into the deep hole of the interweb, I stumbled across a quote that really hit home for me. After dwelling on it for a few minutes I immediately knew that this a quote that I, and the rest of the world, should be living by. I am constantly reminding myself of the importance of compassion, but have realised that there is a severe lack of it in this chaotic world. Compassion to me isn’t the common definition of feeling sorry for everyone and everything that lives. Compassion to me is having a little trust, respect, care and empathy for things you have no idea about. We as humans, let our minds control us into believing that our opinions are the only ones that matter… It’s pretty farcical. Drilling the word compassion into my head, always reminds me that I ultimately know nothing – It sounds stupid but give it some thought. We have no idea what people are going through, how they are feeling or what their mind is telling them. Our beliefs depict what we think we know. Our mind tells us what we should believe… But, we essentially have no idea about anything other than what we’ve experienced. It’s pretty logical huh? Unfortunately, this logic is completely insignificant due to our greed. We are too caught up in our own way of life and are always in search of instant gratification. We care too much about ourselves and don’t want to think too hard about things that don’t necessarily affect us…And that’s the problem. Comparison is nothing but a thief. It steals joy, love and compassion from the human race. It makes us angry at people that have achieved things we only dream of. It makes us impassive to situations where people are suffering. It makes us greedy, heartless and shallow; 3 things you certainly don’t want to be. No matter the situation, whether it’s a global issue, a petty argument in your home, or someone who’s kicking goals that you’d love to be kicking… Remember to imagine stepping your feet in their shoes. There are people around the world that are constantly being judged for things they can’t control; their skin, their religion, their sexuality and their backgrounds. 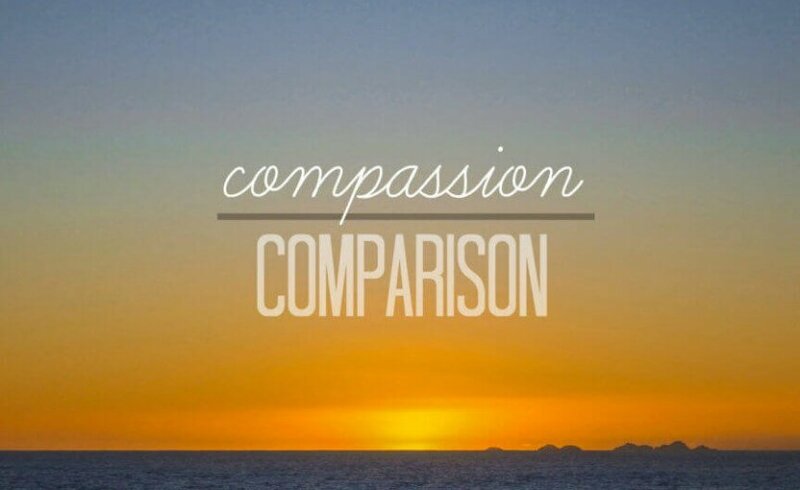 There is devastation around the world that we are constantly comparing to our success. We are far too quick to jump on things that we will inevitably never know. As cheesy as it sounds, you are on your own path; along with every other person on this planet that is on their own too. “Just because your path is always building, doesn’t mean you can’t help those whose path is constantly breaking”. One situation that always reminds me of the severe lack of compassion, is the thousands of innocent, struggling refugees that are fleeing from devastation, death and extreme poverty around the world. It’s so ridiculous to me that people are still more concerned about how their arrival is going to affect them in their already happy lives. It’s really not that hard to be kind, is it? Stop letting comparison become a greedy, acquisitive thief. Instead, let’s try to remember that compassion means opening your heart. It’s nothing to be scared of. Your turn! Do you have a favourite quote that resonates with you?